Aprés l’Ondée was my very first Guerlain. For a long time I also thought it would be my only one (insert hearty laughter here), because I thought all the others were not my style, I couldn’t imagine myself in something as challenging and grown-up as Shalimar or Vol de Nuit. As my dear, constant readers know, times have changed and Guerlain is my favorite (if I absolutely had to pick!) perfume house. I have tried most of the classics and many of the exclusives by now and it turned out I can wear many of them. 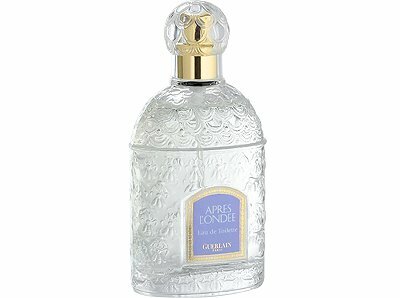 But Aprés l’Ondée still has a place in my heart (and my perfume closet) as my first Guerlain, and arguably the loveliest. Aprés L’Ondée starts with top notes of bergamot and neroli as well as violet together with spicy anise. 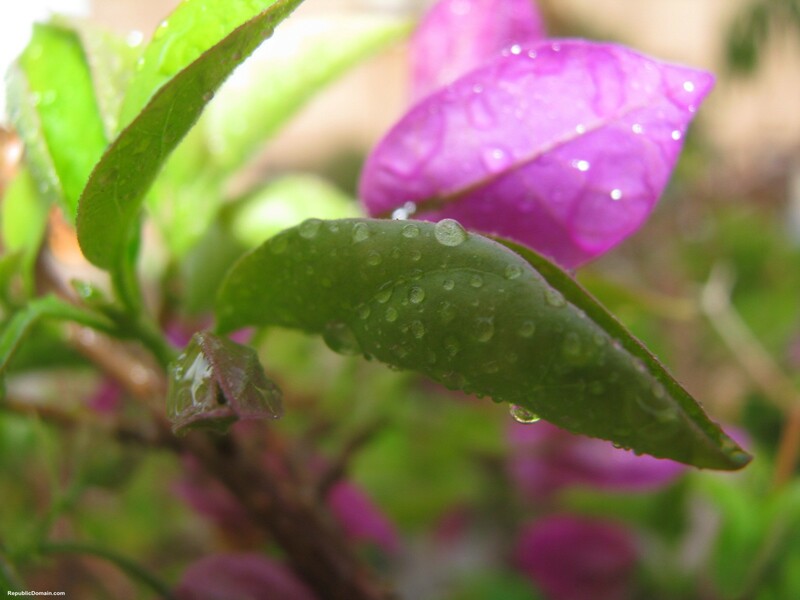 It smells like a garden in spring-time after a torrential rain. There is the smell of wet leaves and flowers warmed by sunshine. As the perfume develops spicy carnation, violet and heliotrope take a prominent place, luckily for me, without getting overly sweet. The drydown lets the iris shine in concert with a soft musky-vanilla note. Aprés l’Ondée is markedly different to the other classic Guerlains. It needs no getting used to, no fear of being called an old lady when wearing it, a lady maybe, but definitely not old. Aprés l’Ondée is soft, sweet, natural, the equivalent of Beethoven’s 6th, the Pastoral Symphony – programme music. It is all there, the lovely flowers, the wetness after a rain shower, the bitter-sweet mood, it all unfolds before our very noses. Aprés l’Ondée is not hard to get, it is all right there for the taking, one only needs to appreciate the loveliness. And that can be harder than one might think, sometimes. I need to be in the right mood for Aprés L’Ondée. Not too cynical, or I get overwhelmed by its loveliness. Not too exuberant or I get dragged down by its wistfulness. Not too mad or I smell only its sweetness. But when I am feeling fragile and a bit overwhelmed with the day ahead of me, nothing is better than Aprés L’Ondée. Picture Source: johnlewis.com, Purple Flower Courtesy of Photo8.com, some rights reserved, thank you! This entry was posted in Floral, Fragrance Reviews, Guerlain, Heliotrope, Vanilla, Violet and tagged Apres L'Ondee, Beethoven, Fragrance, Guerlain, Pastoral, Perfume, Review, Shalimar, Violet. Bookmark the permalink. Oh damn it! My favourite fragrance that I have never tried! From descriptions it sounds as if I would love it deeply, as you do. And the match with the Beethoven is wonderful. But I always hesitate because what if, well, it’s an anti-climax and my reaction is ‘meh’. So time after time when I put an order into TPC, I still don’t include Apres l’Ondee. It’s silly I know. Denying myself the pleasure is better than coping with potential disappointment. Still, I enjoyed your lovely review. Carnation, violet, heliotrope. Oh man. Is there something about heliotrope that evokes melancholy? I seem to to remember reading that somewhere. I love the sound of this and I don’t think I ever tried it (or if I did, I don’t remember it). Most Guerlains have passed by me. I was on the hunt for the pure perfume of Apres for the longest time. It has proven really hard to find one, especially if I don’t want to use up my children’s college funds. Frustrated I have given up, and then it occured to me: Isn’t it the hallmark of beauty to be fleeting, isn’t brevity the necessary companion of a fragile, haunted loveliness like Apres l’Ondee possesses? Now I think maybe that is true and I am content with it. For some reason, on me the EDT lasts really well, but whereas in the past I always thought of it as light. At any rate, I get compliments on it long after I stop smelling it myself. I now what you mean about having to be in the right mood for this. But when the mood is right, ALO is such an incredible beauty. Despite the fact this is a no-go for me on account of the violet/anise/heliotrope combo I can still appreciate that it’s a wonderful scent containing both brains and beauty. I think “wistfulness” describes it’s mood perfectly. Oh, yes you mentioned your intolerance for that combination, too bad. Do you have any “wistfulness” scents in your arsenal without your nemesis notes? I agree, it is certainly happier than L’Heure Bleue, but I like them both for different reasons and different moods. Your post makes me want to try it! I enjoy reading your lovely descriptions. Thanks again!